When the term ‘analytics’ is used, many people may think that it is complex and overwhelming; and for the most part, they may be right. This is why it pays to have the right people to walk you through customized, step-by-step analytical website reports. With so many analytical tools out there, including Google Analytics, it may be hard to decide which tool is best for you and your business. 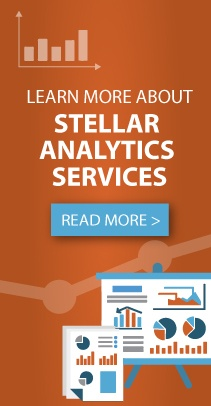 Stellar Analytics is backed by our very own Stellar Blue Analytics support team, that is on-hand and accessible Monday through Friday from 8:00 a.m to 4:30 p.m. That is just one of the many featured benefits that Stellar Analytics offers compared to other options. If we could create a wishlist of features that are important to a business owner, privacy and protecting our information would surely be on the top of our list. Unlike other options, such as Google Analytics, Stellar Analytics ensures that your tracked information, including visitor behavior is kept private. Your information is never shared with third parties or other advertising companies. In addition, Stellar Analytics can block you and your employees’ IP address to ensure you are getting the most accurate information. Although, Google Analytics a similar feature, you would have to manually create filters within your analytics dashboard. This involves several steps just to get close to same end result with a higher change of error. Once our Stellar Analytics team has your IP addresses you wish to block, we can go in and do this on your behalf at no extra cost. Most importantly, Stellar Blue continually monitors spam websites that try to skew your data. The Stellar Analytics team blocks the spam sources’ IP from being tracked to ensure the most accurate and clean data is being delivered to you. One of the most exciting and rather interesting features of Stellar Analytics is how we can utilize visitor information and generate potential leads for our clients. We can create custom segments of your website traffic to isolate your website visitors that meet specific criteria. You can segment out visitors based on location, how many times they visited your site or certain pages or how long they were on the site. This allows you to analyze a smaller list of high quality, engaged visitors and leads. For example, if you find you have a visitor that keeps returning and favoring a specified section of your site, Stellar Analytics is able to track their IP address to show the longitude and latitude of their location. From there, we can plug that into a map and pinpoint the location, city and potentially a street from where they are searching your site! If, this is a business this could likely be a potential lead to your company. Listed above are only a few examples of the many features that sets Stellar Analytics apart. With the ability to track potential leads and being able to ensure your information is clean, safe and secure, it is no guess that Stellar Analytics has more to offer to our clients than our leading competitor. Contact our Stellar Blue Analytics team to find out how we can create a customized analytics report made for you and by you.